Martha's Vineyard is its own entertainment: strolling by picket-fence houses, swimming at the beaches, biking past marshes, forests & island heath, or sailing. Should you wish purposeful activity, find out about festivities and special events from the various information sources. The island's most important annual event is the annual Regatta and Around-the-Island Race, held on a weekend in late July (hotels are extra-full then). There are also church-sponsored white elephant sales, musical concerts (many free), lectures, dances, movies, tournaments (kite flying, fishing, table tennis), community sings, and the like. 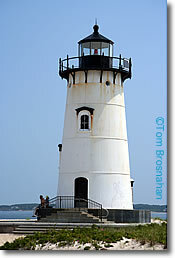 Edgartown Lighthouse, an easy 20-minute walk from the center of Edgartown.